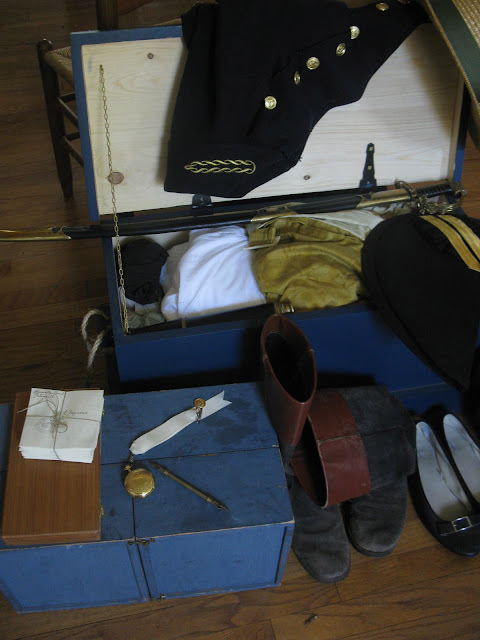 My sea chest is packed for my trip to meet the 10 ships that are to converge upon Brockville along the St. Lawrence River. Copy of a Letter from the Hon. Captain Cupel, of H. M.S. La Hogue, to John Wilson Croker, Esq. 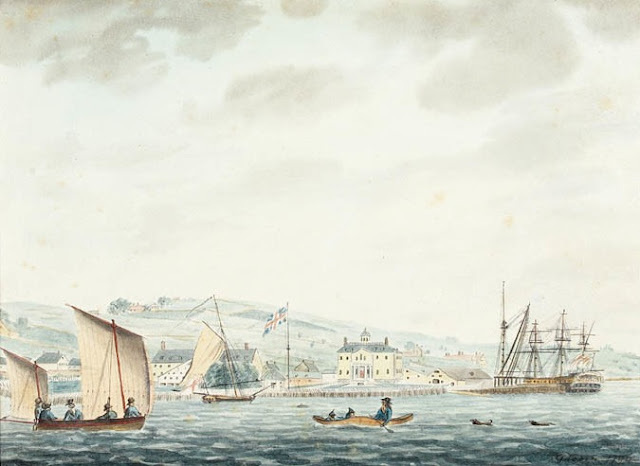 dated at Halifax, June 11, 1813. It is with the greatest pleasure I transmit you a letter I have just received from Captain Broke, of H. M.S. Shannon, detailing a most brilliant achievement in the capture of the United States' frigate Chesapeake, in fifteen minutes. Captain Broke relates so fully the particulars of this gallant affair, that I feel it unnecessary to add much to his narrative ; but I cannot forbear expressing the pleasure I feel in bearing testimony to the indefatigable exertions and persevering zeal of Captain Broke, during the time he has been under my orders : placing a firm reliance on the valour of his officers and crew, and a just confidence in his system of discipline, he sought every opportunity of meeting the enemy on fair terms, and I have to rejoice with his country, and his friends, at the glorious result of this contest : he gallantly headed his boarders in the assault, and carried aJl before him. His wounds are severe, but I trust his country will not belong deprived of his services. and Senior Officer at Halifax. Shannon, Halifax, June 6, 1313. I have the honour to inform you, that being close in with Boston Light House, in H. M. S. under my command, on the 1st inst. I had the pleasure of seeing that the United States' frigate Chesapeake (whom we had long been watching) was coming out of the harbour to engage the Shannon ; I took a position between Cape Ann and Cape Cod, and then hove-to for him to join us the enemy came down in a very handsome manner, having three American ensigns flying ; when closing with us he sent down his royal yards. I kept the Shannon's up, expecting the breeze would die away. At halt-past five P.M. the enemy hauled up within hail of us on the starboard side, and the battle began, both ships steering full under the topsails; after exchanging between two and three broadsides, the enemy's ship fell on board of us, her mizen channels locking in with our fore-rigging I went forward to ascertain her position, and observing that the enemy were flinching from their guns, I gave orders to prepare for boarding. Our gallant bands appointed to that service immediately rushed in, under their respective officers, upon the enemy's decks, driving every thing before them with irresistible fury. The enemy made a desperate, but disorderly resistance. The tiling continued at all the gangways, and between the tops, but in t-vo minutes time the enemy were driven sword in hand from every post. The American flag was hauled down, and the proud old British Union floated triumphant over it. In another minute they ceased tiring from below and called for quarter. The whole of this service was achieved in fifteen minutes from the commencement of the action. I have to lament the loss of many of my gallant shipmates, but they fell exulting in their conquest. My brave first lieutenant, Mr. Watt, was slain in the moment of victory, in the act of hoisting the British colours; his death is a severe loss to the service. Mr. Aldham, the purser, who had spiritedly volunteered the charge of a party of small-arm men, was killed at his post on the gangway. My faithful old clerk, Mr. Dunn, was shot by his side; Mr. Aldham has left a widow to lament his loss. I request the commander-in-chief will recommend her to the protection of my Lords Commissioners of the Admiralty. My veteran boatswain, Mr. Stephens, has lost an arm. He fought under Lord Rodney on the 12th April. I trust his age and services will be duly rewarded. I am happy to say, that Mr. Samwell, a midshipman of much merit, is the only other officer wounded besides myself, and be not dangerously. Of my gallant seamen and marines we had twenty-three slain, and fifty-six wounded. I subjoin the names of the former. 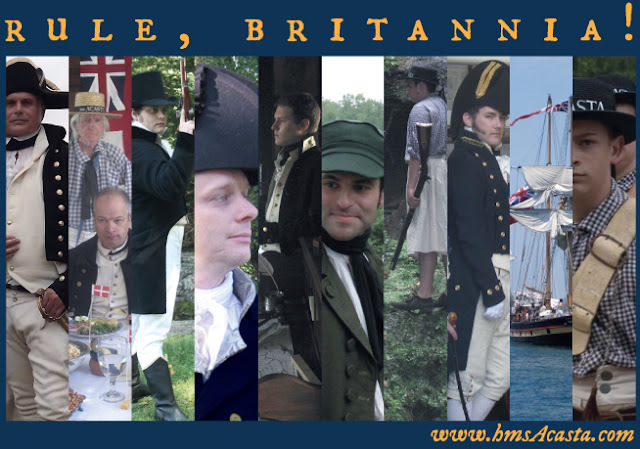 No expressions I can make use of can do justice to the merits of my valiant officers and crew ; the calm courage they displayed during the cannonade, and the tremendous precision of their fire, could only be equalled by the ardour with winch they rushed to the assault. I recommend them all warmly to the protection of the commander-in-chief. Having received a severe sabre wound at the first onset, whilst charging a party of the enemy who had rallied on their forecastle, I was only capable of giving command till assured our conquest was complete, and then directing second Lieutenant Wall is to take charge of the Shannon, and secure the prisoners. I left the third lieutenant, Mr. Falkiner (who had headed the main-deck boarders), in charge of the prize. I beg to recommend these officers most strongly to the commander-in-chief's patronage, for the gallantry they displayed during the action, and the skill and judgment they evinced in the anxious duties which afterwards devolved upon them. To Mr. Etough, the acting master, I am much indebted for the steadiness in which he conn'd the ship into action. The Lieutenants Johns and Law, of the marines, bravely boarded at the head of their respective divisions. 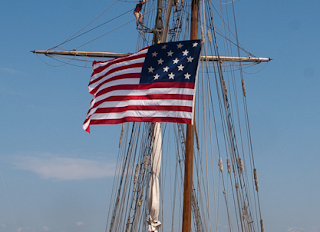 It is impossible to particularize every brilliant deed performed by my officers and men ; but I must mention, when the ship's yard-arms were locked together, that Mr. Cosuahan, who commanded in our main-top, finding himself screened from the enemy by the foot of the top-sail, laid out at the main-yard arm to fire upon them, and shot three men in that situation. 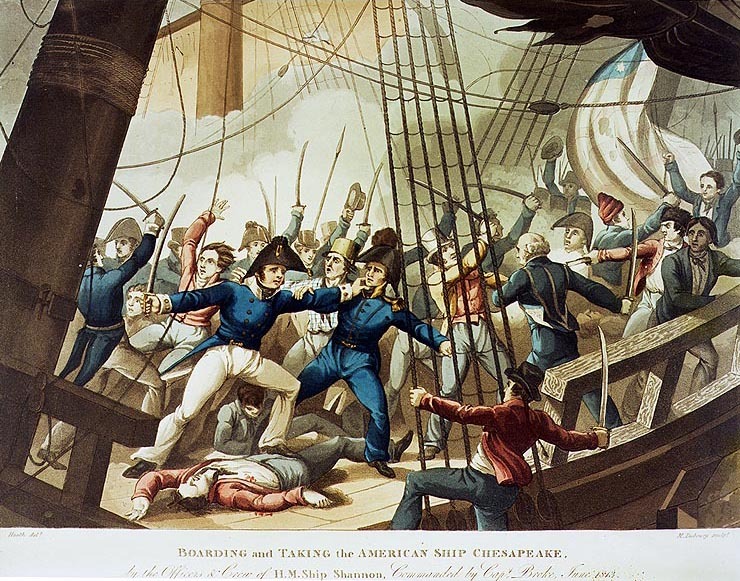 Mr. Smith, who commanded in our fore-top, stormed the enemy's fore-top from the fore-yard arm, and destroyed all the Americans remaining in it I particularly beg leave to recommend Mr. Etough, the acting-master, and Messrs. Smith, Leake, Clavering, Raymond, and Littlejohn, midshipmen. This latter officer is a son of Captain Littlejohn, who was slain in the Berwick. The loss of the enemy was about seventy killed, and one hundred wounded. Among the former were the four lieutenants, a lieutenant of marines, the master, and many other officers. 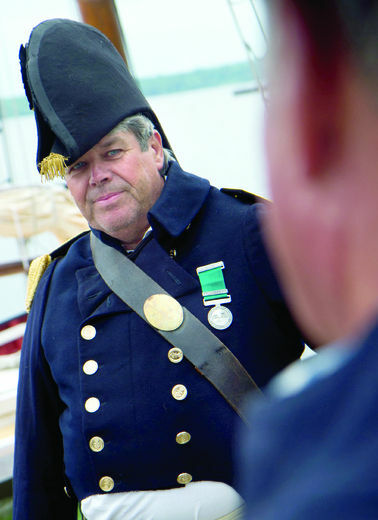 Captain Laurence is since dead of his wounds. The enemy came into action with a complement of four hundred and forty men ; the Shannon, having picked up some recaptured seamen, had three hundred and thirty. The Chesapeake is a fine frigate, and mounts forty-nine guns, eighteens on her main-deck, two-and-thirties on her quarter-deck and forecastle. Both ships came out of action in the most beautiful order, their rigging appearing as perfect as if they had only been exchanging a salute. To Captain the Hon. T. Bidden Capel, &c. Halifax. 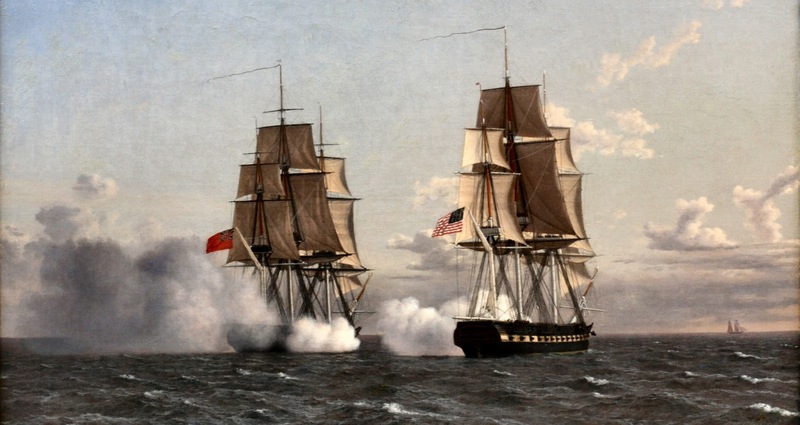 On the 1st of June (1813), very early in the morning, the American squadron got under way and stood out to sea ; but at 9 a.m., just as they were clearing the Sound, the ships were discovered by the British 74-gun ship Valiant, Captain Robert Dudley Oliver, and 18-pounder 40-gun frigate Acasta, Captain Alexander Robert Kerr. The two British ships gave chase, and the three American ships put back ; both parties hauling to the wind under all sail. At about 1 h. 30 m. p.m. the American squadron bore up for New-London ; and the United-States and Hornet, being too deep for their trim, started their water and threw overboard a part of their provisions. At 2 h. 15 m. p.m., being far ahead of the Valiant, and just within gun-shot of the United-States, the Acasta fired a bow-chaser at the latter, just as the Macedonian was rounding New-London lighthouse. The United-States returned the shot with one from her stern. 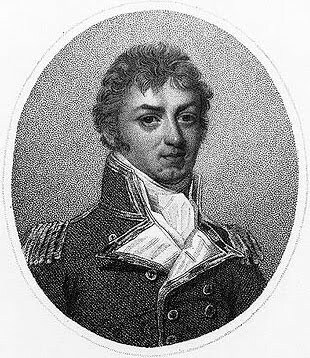 Instead, however, of bringing to and trying to cut off the British frigate from her consort, as many of the spectators on shore expected to see done, Commodore Decatur stood on, and anchored with his squadron in the river. Having shortened sail, the Acasta hauled to the wind, and tacked, and soon afterwards, with the Valiant, anchored off Gardner's island, distant about 12 miles from New-London. Having no persons on board acquainted with the navigation of the Sound, the British ships, particularly the 74, chased with much less effect than they otherwise would. It was not, of course, known to Captain Oliver, that he might even have followed the American squadron into New-London; and that, had the United-States and her companions ascended the river beyond his reach, he might, with very little risk, there being no battery of any consequence, have placed the Valiant and Acasta against the town, and blown the houses about the ears of the inhabitants, if they refused to deliver up the ships. For several weeks previous to this event, the New-York and Boston papers had been filled with panegyrics on their "naval heroes," whose valour they depicted as impetuous, amounting almost to rashness. Some of the papers, as if a little ashamed of what they had said, now added "a rasée " to the two British ships, and gave that as a reason that the American commodore suffered his squadron, to be chased into New-London. from: "The naval history of Great Britain, from the declaration of war by France in 1793, to the accession of George IV. Volume VI."